Toetags Electronics is a builder of fuzz and overdrive pedals from Montreal, Canada (technically, they are a builder of ‘custom audio devices’ which means they also build amplifiers, but if you want to hear more about that I’m sure you can find some other site to obsess on – we talk about pedals here). Like a lot of custom/boutique builders Toetags Electronics hand-builds their pedals. This means one-by-one, hand-wired, handpicked components and tested with diligence before leaving the shop. They specialize in melding new and old components to create rich, unique fuzz sounds. Their aesthetic is stripped down and simple. You won’t find any screen prints or dilly-dally-graphics adorning the outside of their boxes. Instead the focus is inward, on the beauty of the layout and the attention to detail in making the circuit come alive. Take a look at a few of these gut-shots. No boards, just wires running from component to component. So fun to see -writ large – what connections make things go fuzz. Supa Fuzz MKII: Our take on the classic and rare Marshall Supa Fuzz. This device is pretty thick & bassy by design, so we tried to stick as close to the original schematic as possible. Killer germanium fuzz in the Tonebender family. 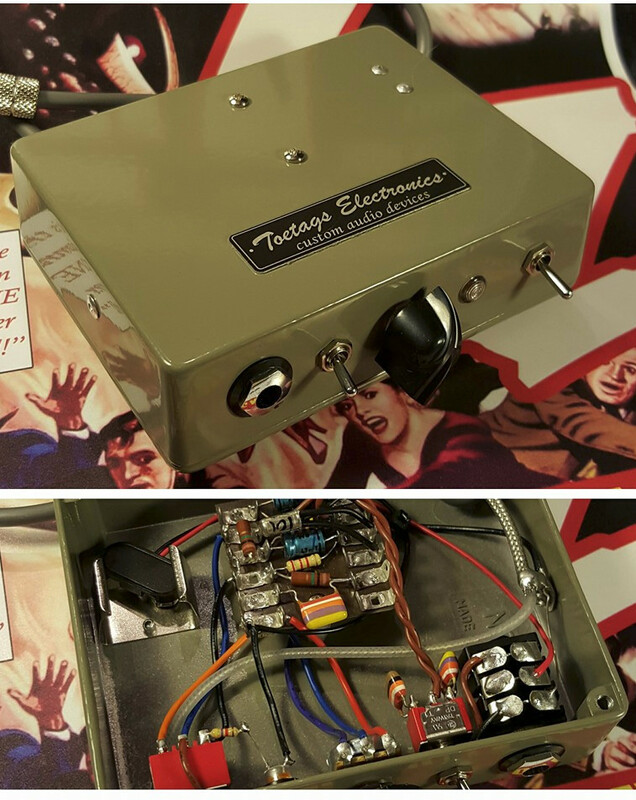 Toe Bender MKII: In honor of the 2015 edition of the Souk@SAT, we introduced a limited edition Tonebender Mk2 fuzz pedal aka the ‘Toe Bender‘. We tried to stay true to the original design, but like all our pedals, we made a few slight tweaks. These are probably the most ‘vintage-sounding’ devices in our lineup. Loaded with three select germanium transistors and a NOS Russian PIO tone cap, these guys are full of fuzz, buzz and splat. 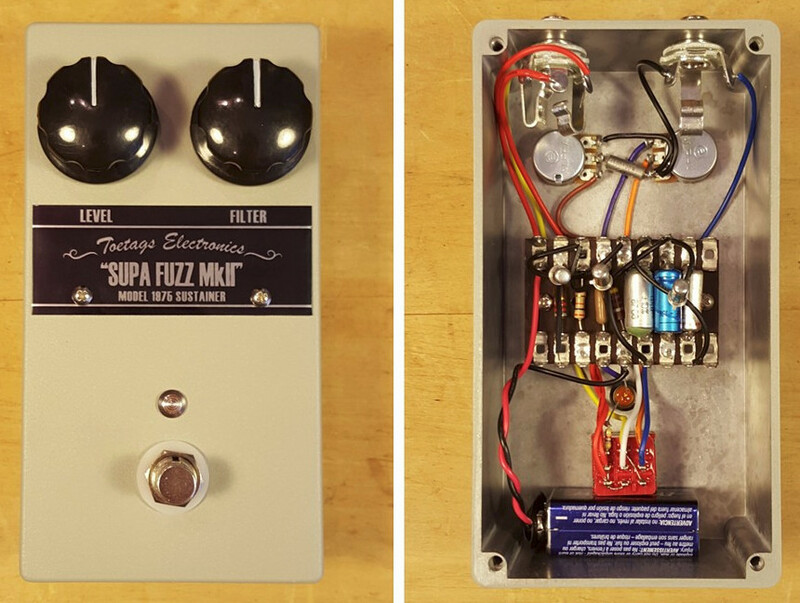 Treble Booster Fuzz: So we decided to build our version of a germanium ‘Range Master’ Treble Boosterfuzz… and it turned out bloody brilliant! We loaded this device with toneful NOS parts and added a ‘treble/full’ boost switch. FZ1 Fuzz: Sometimes one control is all you need… Our take on the classic Colorsound fuzz circuit. This dual silicon beast is thick and meaty with a nicely balanced tonestack that veers to the heavy side. As you increase the output, the saturation increases as well as the volume. Don’t let all that fuzz scare you though, this device responds very well to your guitar’s volume control. You can coax some great crunchy lower gain tones out if it with a simple turn of a knob. Sounds huge on guitar and bass. EF1 Fuzz: Based on one of our favourite pedals: the Jordan Bosstone. We kept the PNP/NPN silicon transistors and tuned the circuit for a thicker tone with less octave. As you raise the Attack control, you will notice an increased lower octave/ ‘splatty’ 60’s sound, but the overall tone will remain thick and full. The toggle switch enables you to go from our stock sound (toggle right) to a more lofi/trebly sound (toggle left). Scavenger Fuzz: Our take on the classic Burns Buzzaround circuit. Using a mix of three NOS germanium transistors and vintage tone caps, we’ve increased the fullness of the circuit while slightly lowering the gain in order to improve on dynamics, clarity and crunch. Keep in mind, this is still considered a high gain device. We kept the standard controls as we think the way the gain and timbre interact provide the best tonal palette. Try using this pedal to boost an already cooking amp to hear some killer overtones. Let us know if you’ve come in contact with any of their wares by leaving a review at Pedal Finder. Here’s a demo of their Scavenger Fuzz!